We will be exhibiting and trading from Glasgow’s SECC this week, Thursday 7th Feb – Sunday 10th Feb! 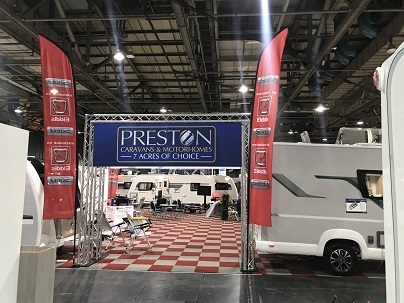 We will be providing incredible show deals on your favourite brands, including our exclusive special edition Elddis Supreme Caravans , Elddis Supreme Motorhomes and Swift Kudos Caravans. Make sure you ask about our Approved Repair Centre (ARC) scheme! Our trusted repair centres ensure that we are equipped to make your after sales experience as convenient and smooth as possible. Don’t forget our amazing Swift offer runs until 24th February 2019, and will be honoured both at our dealership and at the SECC this week! Not only that, but all Elddis Supreme motorhomes bought at the SECC this week will come with FREE motorhome wifi!